We are proud to honor Laura Bonavita, chair of Membership Outreach, as JLW Chair Extraordinaire. A fourth-year Active, Laura jumped into leadership this year and didn’t look back. With her team, she worked to improve the popular small groups program, expanding the scope and capturing data from participants. Participation more than doubled from fall to spring when the book clubs were launched, with members clamoring for a spot. Connecting with members is important in any organization, but especially so in a league of our size. Congratulations, Laura and keep up the good work! Did you know there are more than 125 leadership positions in the JLW? Each year, an amazing group of women answer the call to serve and their talent and skills form the support structure upon which our organization runs. Just as we value and appreciate your membership, we appreciate their service. 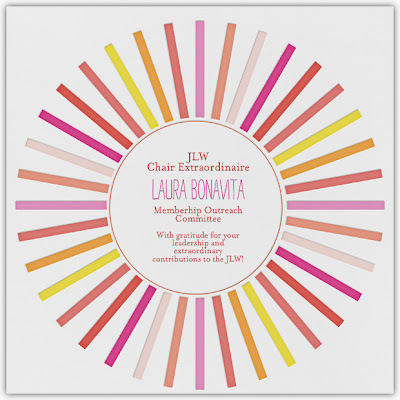 The JLW Chair Extraordinaire was a new award for our Centennial year. Each month, council directors nominated a leader for consideration and one chair was recognized by the president.